We’d love your help. Let us know what’s wrong with this preview of Nighthawk by Clive Cussler. The world s most dazzling new technological advance may turn out to be mankind s last, unless the NUMA crew can beat the clock. The thrilling new NUMA Files novel from the #1 New York Times bestselling grand master of adventure. When the most advanced aircraft ever designed vanishes over the South Pacific, Kurt Austin and Joe Zavala are drawn into a deadly contest to locate the fallen machine. Russia and China covet the radical technology, but the United States worries about a darker problem. They know what others don t that the X-37 is carrying a dangerous secret, a payload of exotic matter, extracted from the upper reaches of the atmosphere and stored at a temperature near absolute zero. As long as it remains frozen, the cargo is inert, but if it thaws, it will unleash a catastrophe of nearly unthinkable proportions. From the Galapagos Islands to the jungles of South America to an icy mountain lake many believe to be the birthplace of the Inca, the entire NUMA team will risk everything in an effort to avert disaster . . . but they may be caught in a race that no one can win." To ask other readers questions about Nighthawk, please sign up. This is the first time I am starting the NUMA files series. Is it ok to start with Nighthawk or do I have to complete all the previous 13 novels to get a good understanding of this? Thanks. Quite possibly the most entertaining (in terms of plot elements, action scenes, high-tech gadgetry, humour, international intrigue, and characters alike) novel yet in the NUMA Files series; at the risk of a spoiler, I daresay the Epilogue in particular is the funniest I've read in a long time. This time Kurt Austin, Joe Zavala, and the rest of the NUMA crew team up with the lovely, super-intelligent, witty, and tough-as-nails NSA (No Such Agency?) operative Emma Townsend to retrieve the wreckage Quite possibly the most entertaining (in terms of plot elements, action scenes, high-tech gadgetry, humour, international intrigue, and characters alike) novel yet in the NUMA Files series; at the risk of a spoiler, I daresay the Epilogue in particular is the funniest I've read in a long time. This time Kurt Austin, Joe Zavala, and the rest of the NUMA crew team up with the lovely, super-intelligent, witty, and tough-as-nails NSA (No Such Agency?) operative Emma Townsend to retrieve the wreckage of a crashed super-secret space plane (the titular Nighthawk) before the Russians or Chinese get it? Soon, however, Kurt and his pals can't help but wonder if there's more to the Nighthawk story than the NSA is letting on, something that's really motivating all parties involved in the chase....and is there a more sinister third party involved? --p. 31: RADM Rudi Gunn a West Point grad? I thought he was Annapolis like Jim Sandecker?? --p. 32: Rudi is "Now in his late forties?" Did Cussler and his co-authors decide to re-boot the timeline of the books so as to keep the characters from again too much? --p. 92: Ahem, that would be petty officers, Joe, not "NCOs." --p. 122: WIKIPEDIA LOOKUP: Glomar Explorer and K-129. --p. 129: Um, Captain Victor [sic] Tovarich, as in Victor "Comrade?" And wouldn't the correct spelling be "Viktor?" And is he a Captain 1st, 2nd, or 3rd Rank? And shouldn't "Mikael" [sic] be Mikhail? --p. 134: Wouldn't Russkies (and the other non-American characters in the book, for that matter) be using meters instead of feet? --p. 169: "Heckler & Koch HK45?" Wouldn't that be HK USP .45? --p. 280: "'There's a difference between governments and terrorists.'" Um, maybe, but it's a pretty thin line sometimes. --p. 325: "during his time in the Air Force?" Wait a minute, I thought Kurt had been a Navy man?? --p. 329: Russian military personnel still using the term "comrade" this many years into the post-Soviet era? --p. 366 (final page): LMAO, effing priceless ending, most hilarious-ever ending to any of the NUMA Files novels, I daresay! What a unique mix of old world and new technology...wow. Scary times for the world thwarted by the NUMA crew to keep all of the world safe. I love Clive Cussler's books. Had this one on my calendar so I downloaded it the day it came out. Ready for the next one. Fourteenth in the NUMA Files action/adventure thriller series and revolving around Kurt Austin and Joe Zavala who troubleshoot for an oceanographic institute. It’s all about greed, and the lengths to which people will go — using global third-person subjective point-of-view certainly helps us to understand the thoughts of many of the characters — to obtain their goal. Cussler/Brown used an action hook in the prologue to grab my attention — and a boring hook (!) in the first chapter. After th Fourteenth in the NUMA Files action/adventure thriller series and revolving around Kurt Austin and Joe Zavala who troubleshoot for an oceanographic institute. Cussler/Brown used an action hook in the prologue to grab my attention — and a boring hook (!) in the first chapter. After that it becomes something of a dramatic Keystone Kops series of actions as all three nations step up, fall down, and run around like mad. I thoroughly enjoyed Paul Trout’s flyfishing technique, lol. The history of the natives of Peru was also fascinating, if tragically sad. Even sadder was the whole business-as-usual vibe amongst the three competing governments. It’s like a game for them, lying and cheating to get what they want. If they don’t win? Oh well, there’s always tomorrow. Well, okay, in this instance, there may not be a tomorrow. It truly is a simple purpose behind the hijacking and that ticking clock scenario created by those convoluted (and quite ingenious) after plans is effective, especially for the planned effect. It’s a revenge I can understand, even if I don’t agree with it. The resolution to the story will crack you up…and reinforce that game plan I mentioned earlier. At least this one will leave you laughing. It’s a race among the Americans, the Russians, and the Chinese to reach that plane. Whoever gets it first will hold all the power…or not. It all depends on those fuel cells holding out. If the cargo thaws, that’s it. And there is no honor among partners…or thieves. Kurt Austin’s past experiences with marine salvage, the navy, and the CIA make him ideal for his current position as a troubleshooter for NUMA. Joe Zavala is Kurt’s partner, an amateur boxer, part of Special Projects, and a mechanical genius. Merlin is a helicopter he “picks up”. The Angler is a multimillion-dollar submersible. …the National Underwater and Marine Agency founded by Vice-Admiral James Sandecker; he's now vice-president of the U.S.A. Its mission is to explore, study, and preserve the world’s oceans. Dirk Pitt is the current director. Hiram Yaeger is the head of their computer department and designed Max years ago. Priya Kashmir is his new assistant. Rudi Gunn is the deputy director. Collin Kane is a bomb disposal expert. Drs. Paul (Ocean Sciences) and Gamay Trout (her doctorate is in Marine Biology with a Master’s in Marine Archeology) are married and an important part of Special Projects; they’ll be stationed aboard the Catalina . Ed Callahan is the captain. DUMBO is the Dynamic Underwater Monitoring Band, a series of highly sensitive listening posts throughout the Pacific Ocean. …control central for bringing back Nighthawk , a hybrid vehicle. Steve Gowdy, the director of ExAt projects for the NSA, is overseeing the final stage of a secret mission, Ruby Snow. His adversary, Air Force Colonel Frank Hansen, is the flight director. …the National Security Administration. Emily “Hurricane Emma” Townsend is a results-oriented specialist, no matter who it hurts, and in this case, if she fails, she’ll blame it on NUMA. A few years back, she’d been part of NASA’s Daedalus Project with Beric, who had been team leader. Hurns and Rodriguez are agents. The MS Reunion is carrying a cargo of fruit; Buck Kamphausen is her captain. Constantin Davidov is the head of the Directorate for Technical Resources Acquisition. The Varyag is a Russian missile cruiser captained by Admiral Sergei Borozdin, a friend of Davidov’s. A Russian Typhoon-class ballistic missile submarine is nosing around. Its captain is Victor Tovarich of the Russian 1st Salvage Flotilla. Mikael is his First Officer. Major Yuri Timonovski was flying the second Blackjack; his flight engineer also survived. General Zhang is with the Ministry of State Security; Lieutenant Wu is his aide. Captain Li Ying is the liaison officer in the People’s Liberation Army. Daiyu “Black Jade”, an extremely capable agent, has been indoctrinated into seeing the state as her mother and father. Juan Feng is her partner, and another of the unborn. Urco is a Peruvian archeologist working a dig connected to the Chachapoya (the Cloud People). Vargas and Reyes are his associates. The Falconer, a.k.a., Birdcaller, is a lone gun working a multitude of his own deals. Diego Alvarado is under attack. Don Costa has funded the expedition. Francisco Pizarro is leading it, I think. The cover finds the Nighthawk re-entering a gray and white atmosphere in an enveloping blaze of oranges, reds, and yellows. Cussler’s name is HUGE in white with a black outline at the top; Brown’s name can almost be seen underneath it and to the right. The title is in a deep red outlined in black at the bottom with the series information above it in white and an info blurb reminding the reader whose adventure it really is at the very bottom. Another great NUMA series book. Kurt Austin and Joe Zavala are back - in partnership with a competent NSA Operative, nick-named Hurricane Emma. Along with the Trouts, especially Gamay, and with Rudi, Hiram and Max providing able support, the team pull off a spectacular save against difficult odds. At stake are EU, China, Russia and US, against the villain's hijacking and usage of something potent, which can cause massive death and destruction in these nations. The villain is depicted well, not a Another great NUMA series book. Kurt Austin and Joe Zavala are back - in partnership with a competent NSA Operative, nick-named Hurricane Emma. Along with the Trouts, especially Gamay, and with Rudi, Hiram and Max providing able support, the team pull off a spectacular save against difficult odds. At stake are EU, China, Russia and US, against the villain's hijacking and usage of something potent, which can cause massive death and destruction in these nations. The villain is depicted well, not a cardboard cut-out of a megalomaniac, rich narcissist, which is the general portrayal of global-destruction villains. The villain and the Russian and Chinese adversaries keep one on tenterhooks as to what's next. Plus, the zany, over-the-top activities of NUMA group ensure that there is not a dull moment in the book. The thrill factor is maintained by classic misdirection in at least two major areas. Lions, tigers and spies. Lots of spies to boot! Kurt and Joe are fighting to save the world from a devastating energy source. That and lots of action. Planes, trains and automobiles (especially SUV's) travelling everywhere. Did they survive in the end? Read the book (lol). It is an ok read. More so for the action-adventure crowd than literary merit. Clive Cussler is constantly blowing my mind with the amazing idea he can portray using his wide understanding of wartime and action writing knowledge. This book is packed with excitement that will get your heart racing from the start. Although the action may seem to start slow, in reality when you reflect on it the foreshadowing will hit you, clear as day! When an incident happens that would cause for some alarm. It seems as if there is too much alarm. Even from the other side of the world. Why Clive Cussler is constantly blowing my mind with the amazing idea he can portray using his wide understanding of wartime and action writing knowledge. This book is packed with excitement that will get your heart racing from the start. Although the action may seem to start slow, in reality when you reflect on it the foreshadowing will hit you, clear as day! When an incident happens that would cause for some alarm. It seems as if there is too much alarm. Even from the other side of the world. Why is everybody so interested in this one thing. And why was NUMA chosen to stop it? The answer lies with the Nighthawk, located somewhere, with a load of hidden secrets. want the technology but there is a big problem. The X 37 is carrying a deadly secret. I'm blown away— this is another fantastic Kurt Austin adventure. Possibly my favorite in the series. If you're a fan of the series, this is a must read book. If you're new to the series, start from the beginning or grab this book to get a taste of the series. You won't regret it! Way longer than it should have been. A lot of twists and turns. Enjoyed it very much. Not a bad story but a lot of the key players in his other books were not present this time around. "Nighthawk" is no exception. The plot revolves around a missing aircraft recently returned to Earth with a secret cargo that is being sought by the American, Russian, and Chinese governments as well as a shadowy organization with an unknown agenda. As part of the search, NUMA special projects director Kurt Austin and his sidekick Joe Zavala wind up in the Pacific Ocean looking for the missing aircraft along with other members of the National Underwater and Marine Agency. They are accompanied by a beautiful NSA agent who knows a lot about the secret cargo but isn't willing to share that information with them. There's a reason for that: It's potentially lethal. Co-written by Graham Brown, "Nighthawk" proceeds along at the requisite Cussler pace: Full speed ahead and damn the torpedoes. The prose is active, the twists and turns come fast and furious, and the villains are - well, not to put too fine a point on it - villainous. As is also typical of Cussler novels, the locales in the book are exotic and the situations the protagonists find themselves in are harrowing. They get in fistfights, they get shot at, and they face very long odds on multiple occasions. They have to battle unfriendly terrain and hostile weather. Despite the fantastic plots and other elements that attract a lot of readers, Cussler's novels also feature a lot of scientific knowledge. They are well researched and, as a result, his books also give his readers summary courses in everything from the behavior of ocean currents to the existence of rare plants and animals. I, frankly, find that to be one of the most appealing things about his novels: They are not simply adventure stories. Cussler's books are not for everyone. Many people object to the plotting and the iron-jawed male characters who can take a punch - or a bullet - and still come out on top in a fight. Others don't like the fact that his books tend to follow a formulaic narrative style. They're entitled to those opinions and to the general criticism that Cussler's novels are escapist in nature. I, however, don't share those objections. True, reading a Cussler novel is a great way to while away a couple of afternoons on the beach or on a couch next to a roaring fire in the dead of winter, but I have to ask: Is that such a bad thing? Yes, the story is well told, well written. The NUMA/Kurt Austin combination works well. The SciTech is intriguing as are all the nautical/maritime bits and pieces Cussler includes. However, while Cussler is good on 'Americana', he falls down badly on The Foreign. This probably won’t bother his fan base, which is probably 75% North American. Yanks know little and care less about the world beyond the oceans. Therefore, Cussler can write nonsense about that world and get away with it in North Ameri Yes, the story is well told, well written. The NUMA/Kurt Austin combination works well. The SciTech is intriguing as are all the nautical/maritime bits and pieces Cussler includes. However, while Cussler is good on 'Americana', he falls down badly on The Foreign. This probably won’t bother his fan base, which is probably 75% North American. Yanks know little and care less about the world beyond the oceans. Therefore, Cussler can write nonsense about that world and get away with it in North America. I'm from Eurasia so my viewpoint is different. His story is dated in the present i.e. 2017/18/19. Yet his descriptions of everything Russian are from the old Soviet union of the 70s-80s. It’s as if he hasn't moved forward 40 yrs. to modern Russia of the Russian Federation. all Yanks have to do...were they bothered to, is to go to Google Earth Streetview and take a Streetview ride through Moscow or any large Russian city to realise the Soviet union is dead and buried. Russia is as Central European as Germany. But no, Cussler has to feed the USSD/Pentagon line that Russia is still as the Soviet Union of the 80s/90s with cranky ships and aircraft and drunk, incapable servicemen. Why not say that the US ships and aircraft are from the 50s/60s and the Vietnam era? He's an idiot with foreign. Centuries ago, in South America, the Incas were wiped out by a disease brought to them by outsiders. Now, hundreds of years later, an object that has been quietly orbiting the earth, for three years, is returning to this same area. As it descends, there is an error in its computer system, and it fails to follow the planned program for its landing. It disappears, crashing into an unknown location. The object contains a weapon of mass destruction that can cause death and devastation on a scale never seen before, It is, therefore, imperative that it is retrieved and neutralized as soon as possible or this same area will be wiped out again. The weapon may not stay stable. This experimental vehicle is called Nighthawk. Experts from NUMA and NSA have been dispatched to find and retrieve it safely, before it can do great harm to civilization and the world. Few people know the real danger that is out there from this spacecraft, not even those looking for it. The Nighthawk is carrying a very dangerous cargo, a cargo that Russia and China are aware of and also want to possess. It is a secret weapon that has been developed in space which is the worst weapon of destruction to yet exist. The country in control would become the most powerful because it could bring about Armageddon. Behind the scenes, a madman is plotting just that. While the book is exciting, there is almost too much intrigue as everything that can go wrong does go wrong. Often, the characters, all of whom are exceptionally bright, seem woefully naïve and trusting and are easily duped. Still, just in the nick of time, they usually save the day. The novel is a thriller and it is narrated well by Scott Brick as all his narrations are excellent. However, the book itself stretches credulity at times and forces the reader to suspend disbelief. Will Kurt Austin and his cohorts be able to save the world from the danger that is out there? Should America have ever conducted the experiments that created this danger? Will these questions be answered? Review originally published at Book of Bogan. Nighthawk is another in the long-running series by Clive Cussler and his co-authors, this time starring Kurt Austin and his band of merry men and women as they get carried off into another adventure for which they're probably underprepared. They are dragged into a mission to recover a top-secret military space plane, but what they uncover is a deadly game of brinksmanship between a number of competing nations, vying to recover the space plane's secret Review originally published at Book of Bogan. Nighthawk is another in the long-running series by Clive Cussler and his co-authors, this time starring Kurt Austin and his band of merry men and women as they get carried off into another adventure for which they're probably underprepared. They are dragged into a mission to recover a top-secret military space plane, but what they uncover is a deadly game of brinksmanship between a number of competing nations, vying to recover the space plane's secret contents. I have mixed feelings about the Clive Cussler books, because I always feel like they're trying to be a bit too much of an academic version of a military thriller. But I find they are much more character-driven than some of the bog standard thrillers going around. With that said, however, while there are an interesting and diverse cast of good guys in this book, only one of the bad guys truly stands out as being of any importance. I never found out enough about the rest of the bad guys to really care about them. While the action is all very exciting, and the pace of the writing is relentless, there just feels like a lack of depth underlying it all. I don't really understand why or how NUMA is the only major government force working on this problem, other than for the purposes of there being a book about it. NIGHTHAWK by Clive Cussler, with Graham Brown, is yet another in a long line of superlative thrillers. This is a NUMA files action story starring Kurt Austin and Joe Zavala. The NSA has a super secret space craft, the X-37, coming back to Earth after three years. But upon reentry it is hijacked by the Russians, but then lost by them. 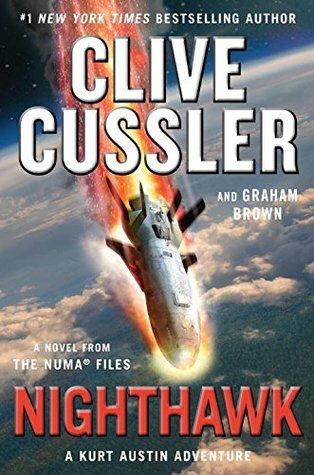 The Chinese are sending a fleet toward South American waters to recover the craft, the Russians are likewise sending craft to the area, but Numa is tasked with find NIGHTHAWK by Clive Cussler, with Graham Brown, is yet another in a long line of superlative thrillers. This is a NUMA files action story starring Kurt Austin and Joe Zavala. The NSA has a super secret space craft, the X-37, coming back to Earth after three years. But upon reentry it is hijacked by the Russians, but then lost by them. The Chinese are sending a fleet toward South American waters to recover the craft, the Russians are likewise sending craft to the area, but Numa is tasked with finding and recovering the secret ship, and it's highly prized mystery cargo, before anyone else can get to it. As always, both Austin and Zavala face danger and intrigue along the way. Beautiful, dangerous women both aid and attack our heroes, but nothing, not even death, can daunt these two on their mission. Once again Mr. Cussler gives us a solid story, great characters, nice historical setting, and action, action, action. It is difficult to fault this entry to the series as it delivers on so many levels. Some may argue that this is a story straight from the cookie-cutter mold, but no one can say that Mr. Cussler's cookies aren't both wonderful and delicious. #14 in the Kurt Austin, NUMA series. #6 written by author Cussler with Graham Brown after 8 entries co-authored by Paul Kemprecos. Very entertaining potboiler from the Clive Cussler stable of writers. As usual, their is a larger than life threat to "life as we know it". But loyal readers, while interested, are not worried because although the villains are extremely capable, they are up against the NUMA team, a US government agency with extremely capable agents backed up by a fantastic virtually #14 in the Kurt Austin, NUMA series. #6 written by author Cussler with Graham Brown after 8 entries co-authored by Paul Kemprecos. Very entertaining potboiler from the Clive Cussler stable of writers. As usual, their is a larger than life threat to "life as we know it". But loyal readers, while interested, are not worried because although the villains are extremely capable, they are up against the NUMA team, a US government agency with extremely capable agents backed up by a fantastic virtually sentient computer. Great fun. Kurt Austin of the National Underwater and Marine Agency has to track down an unmanned experimental aircraft, the Nighthawk. The Nighthawk went off course and disappeared as it was returning from a three-year mission in orbit. Kurt and his NUMA team, aided by the NSA's Emma Townsend, have seven days to "find and shut off a ticking bomb that could shake the very foundations of the Earth." It soon becomes apparent that there's more at stake concerning the secret aircraft than Emma is admitting. Also chasing the Nighthawk are Russian and Chinese forces, in particular a deadly Chinese operative, Daiyu, who works for the Ministry of State Security. Meanwhile, Kurt must deal with double and triple crosses from his supposed friends. This novel hovers on the borders of science fiction, the plot behind it so far fetched as to make it difficult to believe, let alone follow. There is plenty of "action," but as one has come to expect with Clive Cussler's novels, the goods guys ALWAYS succeed and ALWAYS win. It is just a question of how many villains and obstacles they have to overcome on their way to ultimate and assured victory. In this case, a super secret space vehicle deployed by the American NSA has been in orbit over three y This novel hovers on the borders of science fiction, the plot behind it so far fetched as to make it difficult to believe, let alone follow. In this case, a super secret space vehicle deployed by the American NSA has been in orbit over three years and is finally being brought home. Yet in its final descent to earth something goes wrong, the vehicle loses communication and no one at Vandenberg AFB in California has a clue what has gone wrong and what has happened to the vehicle. This sets off a mad scramble involving the Americans (strangely, it is NUMA that is called upon to find the vehicle and the U.S. military takes no role whatsoever), the Russians and the Chinese to find the space vehicle and its contents. The action continues right up until the last page.